Made with our precious green desert clay, this clay cleansing gel is grit free, light, and amazingly effective. Some clays have an affinity for water, and some clays tend to reach saturation very quickly. Many smectite clays have swelling properties that are formed when the clay is hydrated. The water molecules become "trapped" between layers of clay. When these charge layers form from hydration, a negative surface charge is created on the surface of the clay particles. Some clays have only one or two unique hydration points, while others have three or four. A super hydrated clay colloid is a swelling clay that is hydrated to its maximum hydration point. The clay cannot hold any more water without the clay particles seperating, or without the clay releasing the water. For this formulation, I start out with Reverse Osmosis antioxidant water. I add a small amount of magnesium bicarbonate, and then add nine times roasted bamboo salt. The starting water used to hydrate the clay has an ORP of -300, and a pH of 9.7. After mixing the 325 mesh clay powder with the water, the ORP stabilizes at around -250. To complete this "antioxidant blast", I add organic essential oils of: Eucalyptus, Tea Tree, Fennel, Bergemot, and Thyme. 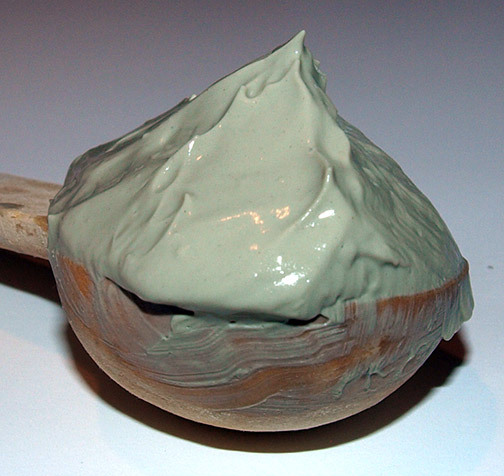 This lightly sulphorous clay gel can be used as a skin cleansing gel, or a facial masque. It is one of my personal favorite formulations. This clay can be used for all skin types. Antioxidant RO Water , Green desert caclium bentonite, Magnesium Bicarbonate, nine times roasted bamboo salt, and organic essential oils of Eucalyptus, Tea Tree, Fennel, Bergemot, and Thyme. To cleanse the skin, rub a small amount of clay gel on the body as desired, preferably before showering or bathing. Rinse completely with warm water. Remove all clay. Towel dry skin. Add a bonding or tacking coat to the skin by rubbing a very small amount of clay deep into the skin's pores. When done, add a second bonding or tacking coat over the first. Finally, add a third, slightly thicker layer of clay over the first two layers. Allow clay to set for 5-10 minutes. Ideally, use a floral water spritzer/spray to prevent clay from completely drying as needed. Rinse completely with warm water. Follow by rinsing with cool water. Towel dry face. Apply a natural moisturing serum right after skin dries, such as frankincense serum. This formula uses just enough roasted bamboo salt to harness the minerals and antioxidant properties. While it is slightly sulfurous, it doesn't have the strong "rotten egg" stench of sulfur springs. It does, however, have the skin conditioning effect of a natural sulfur hot spring! When using this clay gel on damaged skin, it will have a temporary and slight drying effect when used -- at first. Simply use a high quality natural moisturizing agent (such as our facial serum). As time goes by, the skin will become healthier and healther. Use this clay as desired. For face and hands, I recommend using either a moisturing serum (face) or natural hydrating hand cream after use.